AIM Investor Focus, the Blackthorn Focus event for AIM-quoted companies, their investors and the media, will run again on October 23rd at the City offices of stockbroker finnCap. "October will be the fifth occasion that AIM Investor Focus has run" said David O'Hara, Founder of Blackthorn Focus. "The event enjoys a high degree of repeat attendance and previous participating companies have gone on to deliver significant share price gains." AIM-quoted companies Cohort, SCISYS, Sprue Aegis and Trakm8 will all be presenting from 11:40 at finnCap. AIM Prospector, the online magazine from Blackthorn Focus is published today. Five companies featured. You can read the August edition here. The July 2014 edition of AIM Prospector, the Blackthorn Focus publication dedicated to AIM-quoted companies, went live to the public today. There is a link to the publication here. 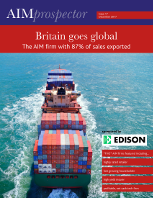 The June 2014 edition of AIM Prospector, the Blackthorn Focus magazine dedicated to covering AIM-quoted companies, is now live. "AIM is home to a large number of fascinating businesses" said David O'Hara, Founder of Blackthorn Focus and editor of AIM Prospector. "AIM Prospector could not happen without the support of its commercial sponsors: Walbrook PR and Spreadex. It is of great credit to these organisations that they support the initiative." AIM Investor Focus, the investor access event for AIM-quoted companies, will run again on April 30th. Six companies will be participating. The event brings together private investors, fund managers and media in one place and on one day to meet some of AIM's most successful companies. Participating companies are: Alternative Networks, Brooks Macdonald, Gooch & Housego, IndigoVision, Lidco and Share plc. The event will be hosted by finnCap. PR partner for the event is MHP Communications. AIM Prospector, the Blackthorn Focus online magazine dedicated to reporting on AIM companies is made available to all readers today.